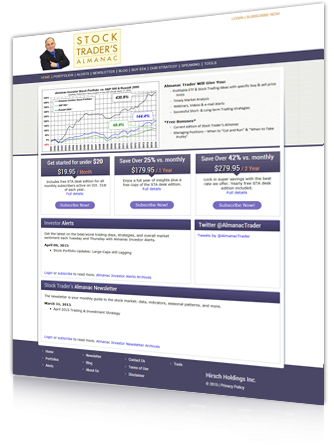 Put trusted Stock Trader's Almanac strategies to work for your portfolio with Almanac Investor -- a digital subscription designed to help active investors implement cyclical, seasonal, and historical market insights with online tools, calculators, alerts and weekly eNewsletter that call out opportunities as they happen. Includes free STA desk edition for all monthly subscribers active on Oct. 31st of each year. free copy of the STA desk edition. Lock in super savings with the best rate we offer. Yearly free STA desk edition included. Profit from invaluable information available nowhere else.